Northeast Rehabilitation and Chiropractic in Wylie is excited to introduce the latest addition to its team!! We celebrated our Grand Opening of the new HydroWorx Therapy Pool. 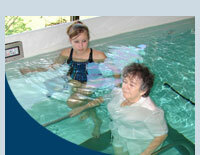 The HydroWorx pool is the ultimate tool in aquatic therapy, rehabilitation and fitness. Its high performance features represent the cooperative efforts of clinicians, engineers and visionaries to develop a radically new aquatic therapy pool. 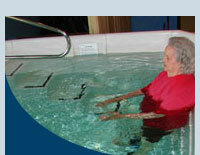 The video on the bottom right of this page shows how beneficial the HydroWorx Therapy Pool can be. Stop by the rehab center in Wylie to check it out! HydroWorx has combined the healing properties of water with the powerful therapy jets, underwater treadmill and massage system to lessen arthritic pain, chronic pain, fibromyalgia; enhance post surgery recovery; and bring relief for other health conditions. These features allow our patients to begin therapy sooner and recover faster. It's the only one of its kind in aquatic therapy in Wylie. With the HydroWorx underwater treadmill patients or athletes can simulate appropriate walking mechanics and exercise virtually pain free. The variable speed treadmill allows patients or athletes to progress at their own pace, while the buoyancy of the water eliminates the fear of falling. An underwater treadmill also provides resistance for range of motion exercises and for stretching and therapeutic exercises. Patients can increase their strength and range of motion of their joints and muscles my utilizing the resistance and therapy jets. Walking or jogging on the treadmill against the jets enhances therapy and builds strength and stamina. Stretching and exercising against the jets also tones and relaxes muscles and the jets aid in stripping the muscles of lactic acid. The HydroWorx pool also offers a complete massage system. This system allows the therapist to adjust the flow to trigger a deep penetrating massage on arthritic joints or a light massage to ease aching and sore muscles. Come by the Northeast Wylie Chiropractic and Rehab for a demonstration. Our patients come from Garland, Josephine, Lavon, Murphy, Nevada, Rowlett, Sachse, and Wylie, TX and as far away as Farmersville and Greenville to take advantage of the healing treatments in our aquatic therapy pool. Click here to watch how much aquatic therapy can help!